Chord labels, in this case, placed on the face of the fretboard, identify the barreing positions for playing major and minor chords. Just push the DULCIMER BARRE® (with soft bar like your finger) down over the label matching the chord in the music, strum, and instantly you are playing chords on the dulcimer without complicated fingerings (see photo above). The labels can also be used for a simplified means of playing melodies on any dulcimer. 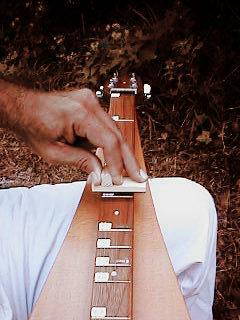 Just as guitars, ukuleles and banjos can be "open tuned" and "barre chorded" with a tool like the GUITAR BARRE®, so too can dulcimers. 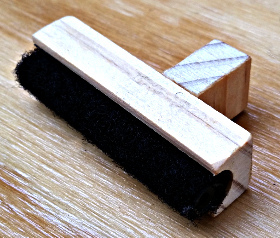 The barre chording tool for the dulcimer (pictured below) is called the DULCIMER BARRE® (also referred to as the CHILD'S BARRE). 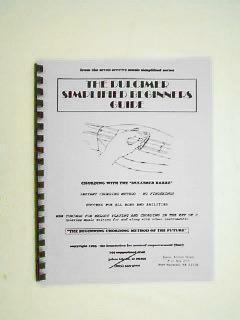 A simply written DULCIMER SIMPLIFIED METHOD BOOK is available for beginners, which includes the attractive fretboard labels, tunings, and a wealth of other information on dulcimer playing not found in other traditional dulcimer playing guides. The DULCIMER BARRE CHORDER and METHOD BOOK (labels included) are $10 each and can be ordered by going to the Guitar Barre Order Form. Also available for ordering is a great Dulcimer/Guitar Songbook with 139 favorite songs all arranged for easy play in the Key of C.
Note: the DULCIMER BARRE® can also be used by young children and adults with special needs to play chords on the guitar when the instrument is laid flat on one's lap, a table, or on the floor. In such cases, chord and note reading labels are placed on the face of the fretboard.